It's ironic how the Chinese government restricts its citizens from engaging with cryptocurrencies, and at the same time Chinese companies like Bitmain dominate the industry. The Chinese government has blocked access to 124 foreign cryptocurrency exchanges that offer their services to Chinese citizens. VPNs have helped Chinese traders of Cryptos get around the government imposed restrictions. The Cryptocurrency Exchanges have also found ways to circumvent the ban by relaunching themselves with new domain names that are registered in other countries outside of China. The government has begun to intensify their scrutiny of foreign websites that have home pages in the Chinese language. They have also censured cryptocurrency media outlets, claiming that they were manipulating the crypto markets. The popular WeChat App has blocked all crypto and blockchain media accounts in order to comply with the government's directives. Cryptos have come to another professional sport franchise. A baseball team is now a participant in the crypto world. The Los Angeles Dodgers now have the distinction of being the first sports team to be involved in a crypto giveaway. They are offering their fans a free download of a digital bobblehead. The first 40,000 fans that walk through the turnstiles of Dodger Stadium on the 21st of September will receive the gift. The Dodgers will face the San Diego Padres that day. "We're excited for our first-ever Crypto giveaway, and (the opportunity) to explore an entirely new marketplace with our fanbase. We hope this piques the interest of Dodger fans, and will help launch a new age of collectables and promotions." Every fan that participates in the giveaway will receive a card with a private code and a set of instructions. They will be led to a webpage where a digital bobblehead token, randomly chosen, can be unlocked and put in the participants Ether wallet. The United States Dollar /Bitcoin (USD/BTC) pairing expressed marginal movement throughout the week. The USD appears to have lost some ground. The dollar began the week exchanging $6,209 /1 Bitcoin. The dollar ended the week exchanging $6,517 / 1 Bitcoin losing 4.96% against Bitcoin by the weeks end. The USD index (.DXY) compares the USD to 6 globally dominant currencies. The USD lost ground when compared to its global counterparts towards the end of the week. The .DXY index recorded a value of 94.5 down 0.05% from the previous trading day. The EUR ended the week marginally stronger against the USD, exchanging at 1.169 / 1, up $0.0004. While the Great British Pound(GBP) maintained a slim advantage over the dollar at the close of the week. The GBP ended the week marginally stronger, pairing with the USD at $1.3115 / 1 gaining $0.0010 translating into a 0.08% gain against the USD from the previous trading day. Many analysts attribute the dollar's loss of momentum to the Consumer Price Index value that was announced at the end of the week. The result was weaker than expected. The currency markets reacted accordingly. The USD's weakness is reflected in the small gains in value of the EUR and GBP against it. 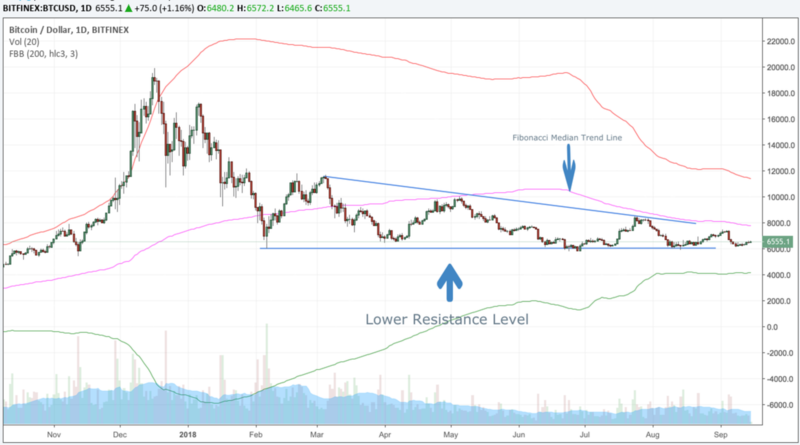 The line has been drawn and the the lower resistance level of Bitcoin has been tested again. Traders and investors have been able to log the levels of Bitcoin trades that have given credence to the lower resistance level of support. Not only that, fibonacci averages applied to Bitcoins trading levels have shown consistency as well. We all wish we had the crystal ball that could tell us where the Bitcoin market will be everyday, but there is no such thing. What is available for investors and traders are the laws of averages. And the hope of the most likely outcomes. This is the fifth instance of Bitcoin bouncing along its low resistance level this year. When Bitcoin rebounds off the low it may not be as high as some dream, but it is substantial. A $1,700 swing in any market oozes with trading opportunities for buying and selling. If the laws of averages hold true for Bitcoin, the graph above illustrates a pattern that could be useful for both long term and short term investors. Although Bitcoins rebounds from its low level of resistance have decreased in size, they fall in line with the fibonacci averages. Over the last few weeks rumors of an ETF application being approved by the Securities and Exchange Commission ignited a short lived bull run. Now technology and world events are so intertwined its difficult to imagine what will increase or decrease the value of Bitcoin. Investors and traders may be inclined to use the law of averages to navigate the stormy seas of Bitcoin price fluctuations. New Age Technology has brought a new member to our New Age Society. Artificial intelligence (AI) combined with blockchain technology have reshaped the security industry. Blockchain technology has taken the functions of a mall cop to state of the art crime stopping machines. Ladies and gentlemen allow us to introduce you to KnightScope. Knight Scope is a company that manufactures robots designed to provide security. They offer 4 models, the K1, the K3, the K5, and the K7. These robots are not a joke. they are bonafide state of the art security devices. These robots have already assisted in the prevention of crime and the apprehension of criminals. They are the first of their kind, and now available to be purchased and utilized by the general public. An actual product that is enhanced by artificial intelligence and the blockchain, to fight crime. The qualifications of KnightScope's security devices are quite impressive. The Robots have already logged in more than 400,000 hours of active operation. They have patrolled more than 194,000 miles. They are being used in 15 American states, at 42 different locations, across 4 different time zones. There are currently 51 machines in the network, serving 39 clients. The KnightScope robots have assisted law enforcement in issuing an arrest warrant for a sexual predator. They have assisted a security guard in catching a thief at a retail establishment. They have prevented a fraudulent insurance claim. They have aided in the apprehension of an armed robbery suspect. They have helped to eliminate vehicle break-ins. They have assisted in the apprehension of a corporate vandal. And they have helped to eliminate trespassers with the aid of a force multiplier effect. If you're impressed with that list of accomplishments. Here's one more piece of information that some may find interesting. KnightScope is raising capital to expand their operations. KnightScope is offering a Series S Preferred Stock through a private placement for qualified investors. This article is not a solicitation and The 21stMoney Team is not a financial advisory service. The 21st money Team is just sharing information for those that may have an interest in this subject. DIVIDENDS: Noncumulative dividends before any dividend on any existing shares of the Companys Preferred Stock or Common Stock at 6% of the Series S original purchase price, if and when declared by the Board of Directors. SECURITY: Series S Preferred Stock (Series S). AGGREGATE PROCEEDS: Up to $50,000,000. PRICE PER SHARE: $8.00 per share. ANTICIPATED CLOSING DATE: Initial closing on or before November 15, 2018, with one or more additional closings at the discretion of the Board of Directors. If you want a Security robot of your very own the price is based on an hourly rate of less than $9 an hour or $6,500 per month over a 3-5 year term contract. The fact that an innovation of this type is actually a reality takes me to the storyboard of a classic movie thriller,'Terminator.' Is this how it all begins? OneRoot Network (RNT) ranks 141st on the list of cryptos ordered according to their market capitalization . RNT's current market cap is $29,370,000. The ONEROOT Project brings together the tangible and intangible resources inside and outside the industry. In the process of optimizing and integrating resources, ONEROOT extends the idea of a shared economy and separates the right to use and the ownership of resources, and proposes the concept of a distributed business engine. With the help of blockchain technology, the co-builders can digitize the right to use resources, including software, hardware, manpower, etc., and establish transparent value exchange and cooperation rules, which greatly improve the resource utilization efficiency. In addition, participants have established a new cooperative relationship based on equal cooperation and common development, which has significant advantages compared with the traditional business model dominated by centralized entities. $83,000.00 worth of RNT changed hands September 14 at $0.1118.